Explore the Top 50 Notifications sent report. Add filters and set their values. Optionally drill down to view user IDs for export. Navigate to the Messages dashboard. In the Top 50 Notifications sent report pane, click the ellipsis icon and select Explore From Here. 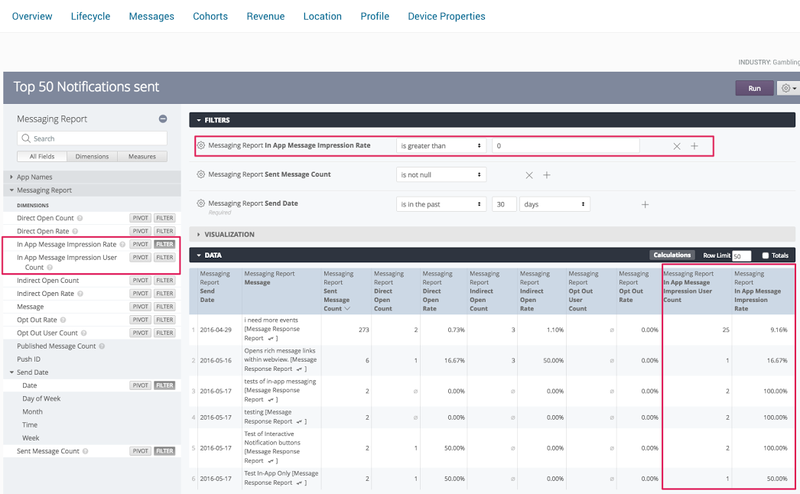 In Messaging Report » Dimensions, click the Filter buttons for In App Message Impression Rate and In App Message Impression User Count. In Filters, set the In App Message Impression Rate filter to "is greater than," and enter zero (0) as the value. Optionally click the user count or rate within the returned data to drill down to a view where you can export user IDs. See Exporting Lists for steps.